Living in the UK, with distinct seasons, it is a challenge to keep yourself in vegetables all year round. By late autumn, it feels there is little left to harvest. Even in spring, when plants are bursting into growth, there are few garden-fresh vegetables available. Growers often have to wait until June – or later if you live further north – for first sowings to mature. Whether you grow in an allotment, garden or window boxes, here’s some advice and practical tips on how to avoid those ‘hungry gaps’ and to extend your harvest throughout the year. Start by looking at hungry gap times, ie March to May, as well as the winter months, from November onwards. What can you get growing before then to keep you in vegetables throughout this period? See below. Once that is sorted, you will find June to October is easy. Remember to write down your plans. Perhaps create a diagram or sketch? This will help you for next year, especially when planning to rotate your veg crops. Rotating where you grow vegetables not only prevents a build up of disease in the soil, but also encourages the most efficient use of soil nutrients. Finally, don’t grow too much of one crop. Gluts of beans, onions, courgettes and lettuces add to your work, as they demand careful storage – or constant cooking! Sow or raise plants early in the year, indoors. Cool, light windowsills in late January and February are perfect for seed sowing, especially if you don’t have a greenhouse. Sowing into a module tray is great for raising plants such as brassicas or lettuce. Because modules have a greater depth of soil than seed trays, they allow the young plants plenty of growing time to put down roots and mature. This means you can either delay planting outdoors (maybe the conditions aren’t right – too cold or wet) or you can plan a succession of plantings, by putting out a limited number every few weeks. This succession means not every plant will mature/bear fruit at the same time. And you will have a constant supply of veg. The key to success in having veg through the winter is successional sowing. After your first flush of spring sowing and planting, continue to sow in mid-summer. This captures the productive growing time in autumn. Carrots, for example, can be sown in June for use over winter. This also has the added bonus of missing the first attack of the carrot root fly. Sow an 'early' variety again in mid July - or August - for a final quick crop. Beetroot is also worth sowing several times, using 'bolt resistant' varieties early in the season, with final sowings around July in mild areas. Autumn onions and garlic can be planted from September to November. Both will be ready in June and July, when stored crops are usually finished, and before your spring-planted onion crop is ready. Choosing the right variety is important when you are sowing through the season. ‘Early' varieties will give a quicker crop at the start and end of the season. Spinach beet and Swiss chard are excellent alternatives to spinach, cropping for months rather than just a few days. Lettuces come in many shapes, sizes and colours. Some can be grown well into autumn. The loose leaf varieties are slow to run to seed. And the cut and come again variety extends the harvesting period. You can sometimes fill the gaps by choosing a different type of vegetable. Cabbage needn’t be huge. Growing smaller should mean an earlier harvest. For advice on how to grow any of the above, and other vegetables, see our How to Grow cards. 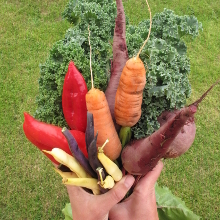 Try mini-veg varieties. These are ready to harvest sooner than a large size variety, which is particularly helpful if you have a short growing season (further North) and they can be sown to cover the ‘hungry gap’. Some are naturally small plants. Others will grow to full size given the chance. The reason they are included in a mini selection is that they will crop well at close spacing. If you harvest veg early you can prevent a mid-season glut. New potatoes, the size of golf-balls, are delicious, as are slim small broad beans which can be eaten pod and all. Alternatively, leave some beans until they are nearly over. Both French and Broad beans can be podded and dried in the autumn for winter casseroles. Cut and come again veg, like spinach beet and loose leaf lettuce, can be picked as soon as the leaves are big enough to eat, and they will go on providing leaves through their growing season (always leave a few on the plant to keep it growing). Can you protect your crops from the cold and/or wet? Fleece, cold frames, cloches all help, as will greenhouses and polytunnels. They all extend the growing season – even the simplest cloche, made from a sawn- off plastic drinks bottle. In the greenhouse or polytunnel, you can use deep pots or grow bags for your veg. Or – if you have space – create a growing bed. At Garden Organic Ryton we grow outdoor crops such as potatoes and peas in the greenhouse beds, using the extra protection to bring them forward several weeks. By July and August the space is clear for winter salads and veg. Some of these would survive outside, but in the warmth and shelter of the greenhouse they will be actively cropping sooner. Crops in containers on a balcony can be protected with cloches or horticultural fleece. Check Harvesting and Storage with tips on how to store veg throughout winter, and in times of glut.